- Publisher Adults aren't the only people asking philosophical questions like, Who am I? Where did I come from? Is there really a God? 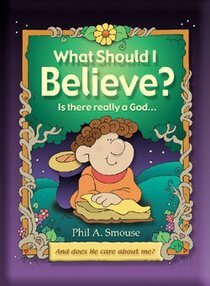 Author and illustrator Phil Smouse gives the younger crowd--kids ages three to seven--Bible-based answers to these questions in What Should I Believe? Written in Smouse's light, accessible style, What Should I Believe? is lavishly illustrated with fun and colorful drawings. Covering topics such as The Truth, The Lie, The Word, My Heart, Born Again, and Forgiven, What Should I Believe? serves as a perfect primer on the Christian life. For children ages 3 to 7. About "What Should I Believe?" Adults aren't the only people asking philosophical questions like, Who am I? Where did I come from? Is there really a God? Author and illustrator Phil Smouse gives the younger crowd--kids ages three to seven--Bible-based answers to these questions in What Should I Believe? Written in Smouse's light, accessible style, What Should I Believe? is lavishly illustrated with fun and colorful drawings. Covering topics such as The Truth, The Lie, The Word, My Heart, Born Again, and Forgiven, What Should I Believe? serves as a perfect primer on the Christian life. For children ages 3 to 7. Phil A. Smouse, bestselling author and illustrator, lives in Pennsylvania with his wife and son.